Ever since Épicerie Boulud opened (yeah, it’s only a week or two), the Accidental Locavore has been looking for an excuse to go shopping there. Unfortunately, or fortunately, the locavore has been way too lazy to pop over to Lincoln Center at 7:00 AM to pick up fresh-from-Daniel croissants. Could be I’m anticipating starting a really bad habit if they’re wonderful (since Lincoln Center and Épicerie Boulud are mere blocks from my apartment) , while on the other hand, the part of me that has spent (not enough) time in France, won’t consider the purchasing of croissants at the end the day. Tonight was different. My brother was in town and coming over for dinner. Before we made our plans, the locavore had been planning to finish the homemade merguez from the last Chacutepalooza challenge (don’t panic, they had been frozen) paired with another of the wonderful, huge, meaty artichokes the Accidental Locavore has been getting from Whole Foods. I decided to cruise over to Épicerie Boulud to see what could round out the dinner. Not surprisingly, the place was buzzing, New York being the competitive city it is, especially when it comes to food and restaurants. 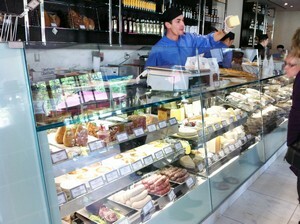 The locavore headed right to the charcuterie counter, figuring a slab of pate would be just the thing. Along with a small but choice selection of pates, were several fresh sausages, which included merguez. Always up for a challenge, I thought I would pit my first attempt at merguez against Daniel Boulud (or Gilles Verot, his charcuterie master). My brother didn’t know which was which and the Locavore would cook them together to try to keep it a level playing field. You might be surprised by this, it was essentially a tie. Boulud’s merguez was a little bigger, the meat was more finely ground and they were much spicier. I preferred the fineness of the grind, while my brother liked my slightly coarser grind. We both found the not-as-spicy Locavore’s sausage more to our liking. If my husband had been in on the tasting, or I had made some couscous to go with the merguez, the Epicerie Boulud links might have won for their heat. I have to tell you that I do feel pretty victorious, considering it was my first (but certainly not last) attempt. 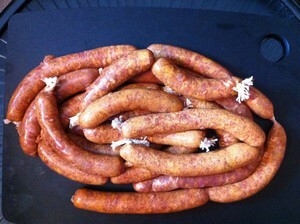 So once again, thanks Mrs. Wheelbarrow for a great merguez recipe!